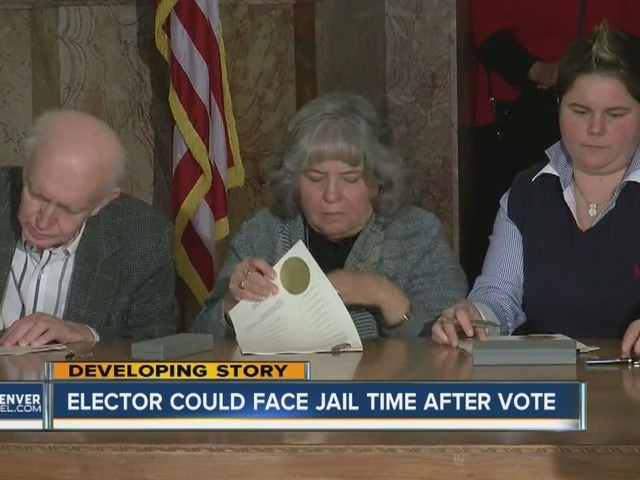 DENVER – In a raucous occasion at the Colorado state Capitol Monday, the state’s nine Democratic electors voted for Hillary Clinton and Tim Kaine as state law requires them to, but only after several last-minute court decisions were made regarding electors’ oaths and one elector was replaced when he failed to vote for Clinton. The vote happened after more than a week of court filings and arguments over interpretations of the state and federal constitutions, as a group of “Hamilton electors” argued the constitution does not bind electors to vote for a certain candidate and pushed for the Electoral College to put someone other than Donald Trump in the White House. However, the push failed, as Trump had garnered the 270 electoral votes necessary to become president-elect by 3:30 p.m. Mountain Time after Texas electors put him over the top. Monday started with the filling of an emergency motion by attorneys for two electors – Polly Baca and Robert Nemanich – asking a judge to overturn an amended oath of office the nine electors would be required to take. 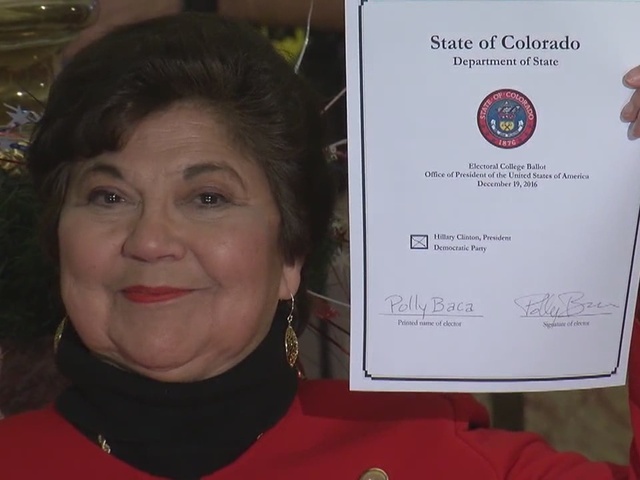 Last week, the Colorado Secretary of State’s Office added language to the standard state oath of office to say that the elector would vote for the candidate who won Colorado’s popular vote. That language stemmed from state statute upheld by both federal and state courts last week requiring the electors to vote for the candidate who won the popular vote. But a Denver District Court judge ruled at 11:30 a.m. – just half an hour before the electors were to take the oath -- that the new language be struck from the oath – seemingly a victory for the electors. At the same time, however, the judge said that Secretary of State Wayne Williams indeed had rule-making power, leaving open the possibility that he again edit the oath in the 30 minutes before it was to be administered in order to force the electors’ hands in voting for Clinton. Indeed, that possibility came true. When the electors entered the governor’s office to take and sign their oaths, they were met with a new oath, ordered in a temporary adoption by Williams , that contained language that was nearly identical to what the district court judge had stripped from the oath a half-hour earlier. Lawyers for Baca and Nemanich noticed and called for the district court judge to review the language. Baca noted that this was the first instance such an oath was administered in Colorado. The judge said that the attorneys would have to file a new motion to protest, and that it would likely not be heard until January – rendering such an option useless with such little time. All nine electors -- Micheal Baca of Denver, Terry Phillips of Louisville, Mary Beth Corsentino of Pueblo, Jerad Sutton of Greeley, Robert Nemanich of Colorado Springs, Amy Drayer of Greenwood Village, Ann Knollman of Arvada, Sen. Rollie Heath of Boulder and former Sen. Polly Baca of Boulder – signed off on the oath, though Polly Baca did not mouth the part that said she was required to vote for a certain candidate. But the drama did not end in the governor’s office. Hundreds of people had gathered in the wings of the west foyer of the state Capitol. While the electors were inside taking their oaths, many of them sang patriotic songs: “The Star-Spangled Banner,” “We Shall Overcome” and “This Land is Your Land” rang through the halls of the Capitol. After the electors had taken their oaths, they entered the foyer to cheers. But the cheers were replaced by jeers for Williams, after one elector, Micheal Baca, illegally wrote John Kasich’s name on the ballot – breaking the oath he had just taken. Baca had been among the vocal opponents of Colorado’s law and a supporter of the “Hamilton electors” movement. Williams began the procedure to replace Baca, as had been detailed in court over the past week, which created a strange and tense atmosphere in the capitol. Some chanted, “Recall Williams,” as he administered the oath to the new elector, Celeste Landry of Boulder. Landry cast her vote for Clinton and Kaine, giving all nine Electoral College votes to the winner of Colorado’s popular vote as the state had argued for all along. Supporters of Micheal Baca’s continued to argue that an interpretation of a ruling from the 10th U.S. Circuit Court of Appeals meant that Williams could not replace an elector after they were sworn in, but that interpretation was different than the state’s. Micheal Baca continued to argue he had been replaced unlawfully as he left the building. Both Polly Baca and Nemanich said their hands were forced in both signing the oath and voting for Clinton and Kaine. Nemanich said he would continue the fight all the way to the U.S. Supreme Court. Williams said in a news conference after the ordeal that he was “pleased” to be part of the process and that the state’s interpretation of its laws had been upheld in both state and federal courts. He said he would refer Micheal Baca to the state attorney general for prosecutorial review. Baca faces jail time or a fine if the attorney general decided to prosecute him for failing to adhere to his oath. “While anyone is free to support whomever they want to [up through the election], when you vote as an elector, you’re acting as a representative for the people of Colorado, and Colorado law is very clear,” he continued. Williams, a Republican, said he was “disappointed” Micheal Baca did not adhere to his oath and reinforced his view that he was upholding state law. Polly Baca said she had signed the oath under duress. “I will sign the oath because I want to vote. But it is under duress because I don’t believe this vote is constitutional,” she said. Despite the attempts by the “Hamilton electors” to get 37 electors set to vote to Trump to do otherwise, Texas’ electors put Trump over the 270-vote threshold necessary to win the presidency. Two Republican electors did not vote for Trump, and while seven Democratic electors tried not to vote for Clinton, three of them were replaced. However, his victory truly ranked 27th of 58 total elections in terms of the number of Electoral College votes he garnered, which stood at 304 at the end of the day. Clinton received 227, and five other people received votes.